February 7th, 2010 by KTU | Filed under 1. Cabin Plans and Design. 1. a slight or rude structure built for shelter, storage, etc. Without taking offense at “slight” or “rude” I happily accepted the definition of a “structure built for shelter, storage, etc.” as befitting my project. My kids thus dubbed my cabin “Le Shed.” There are actually some very nice precedents of writing sheds and garden sheds. A garden shed is displayed at the top of this post. 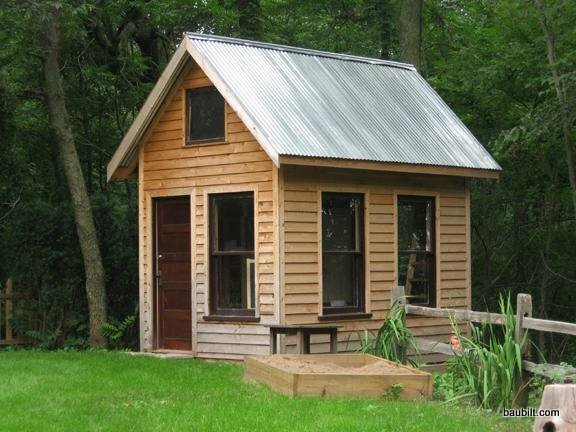 Here is a nice writing shed built by Michael Pollan and described in his book A Place of My Own. A final note on building permits. You may not need one. In many municipalities no permit is required for an accessory building of less than 120 square feet (sometimes this is 100 square feet). At one point when navigating the building permit issue, I considered a pair of 100 square-foot structures, each on their own boulder, possibly with a bridge connecting them. In some ways I’m sorry I got my shed permit as that would have been a fun approach. I am really undrstanding zoning and pemits. The President wants to end homeless in 10 year. So All the big city Mayor get on the band wagon also. But we are trying to make a village like digntyvillage.org did in Portland, OR. but you go to the zoning department and they say there is not a code for you to do it. So now they make up on from bits and pieces. Bottom line now you have a $2600.00 bill before you hammer a nail into your project. It’s all about money to these City’s how much can we get out of people that do a good think for the City & State to help with homelessness. I dont want to end it I just want to build a small shack to get them off the ground and in a dry place. But it is a dollar game to the City & State but we don’t have the money to do it budget cuts, ect. excuses. Help me out if you have an awnser to my e-mail. Yes, health and safety are and should be the number one consideration on anything especially places where people live and a plan approval and building permit can be used for that purpose. The other purpose is data to be entered into a data base for property tax purposes.